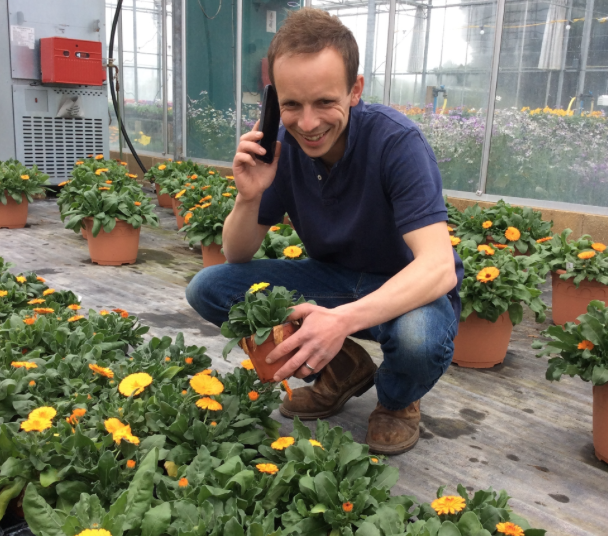 Listeners to 'This Week in the Garden' (iTunes) from Thursday 27th April 2017 may be interested to see this photograph, it shows Tim Kerley, second generation plant breeder in Cambridgeshire, on the telephone recording his interview. He is surrounded by Power Daisy novelties, some of which may be available to gardeners in 2018/9. Tim’s Power Daisy Sunny came third in the Chelsea Flower Show Plant of the Year Competition in 2016 and will feature again in a Back Garden display at Chelsea Flower Show this year.